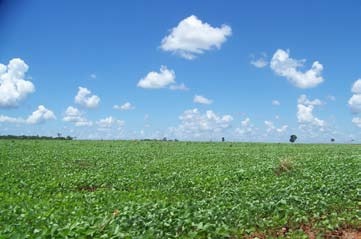 In the 1970s some farmers from the South of Brazil moved their traditional soy cultivation to Paraguay. By 1999-2000, the cultivation of transgenic soy had spread quickly in Paraguay, and the country became the worlds third largest exporter, and fourth largest producer, of soy. From the end of the 1990s, affected farming communities, forced to leave because of the installation of massive plantations, asserted their land rights and denounced the serious environmental damages and health problems caused by herbicides used for the GMO crop production. They also denounced the destruction of subsistence crops caused by the expansion of soy monoculture. Project Details In 1995 there were 800,000 hectares of soya grown in Paraguay. Eight years later, in 2003, soybean farming increased to 2 million hectares, while production rose from 2.3 million to 4.5 million tons. The Paraguayan Government plans to assign another 2 million hectares of land to genetically modified soy monoculture. In Paraguay the majority of productive land is in the hands of a few big landowners, who represent just 2 percent of the population but own 80 percent of the land. The use of herbicides causes serious soil and water pollution, threatening food sovereignty and local community health provoking skin and breathing diseases. Development of Alternatives Land redistribution and agrarian reform. Crops' diversification. Why? Explain briefly. Although a small part of the displaced people have been given a piece of land, the majority of the population has no land to live. Moreover, all the affected families by the toxic herbicides (some of them dead) have not received compensation. Since 1996, more than 1.2 million hectares of forest have been cut down to grow soy rather than food and other crops. Over the last 20 years 100,000 small-scale local farmers have migrated to city slums or to other countries or have become landless. Each year in Paraguay 9,000 rural families are evicted by soy production and nearly half a million hectares of land are turned into soy fields.